Posted On February 14, 2015 by Team iCynosure. It’s the season of love and everyone is either with someone special or trying desperately to hook up with someone special. Of yes me too. Whenever I think about who my ideal partner, my ideal Valentine would be… there is a clear picture that I see through my hazy, dream-filled eyes. Good looking, with a great body and amazing features. Added a pinch of tall, dark and handsome and I’m set. Throw in a great image, a great built and someone who has a large heart, and I’m in for keeps. A visibly sturdy outlook with a great mind coupled with a good and healthy inside. Easily who can protect me from the harmful elements along with one who is resistant to minor and major damages, wow that’s a dream come true. Oh yes, he needs to be sensitive to my needs. Someone who has an antenna that more or less connects me to the world and to him, funny isn’t it. Someone who gets instantly affected and reacts to my subtle touches without having to express myself way too much; heaven wouldn’t it be? The greatest turn on would be a long-life commitment with an amazing attachment. A committed hottie irrespective of what I do… be busy with the internet, or with my friends or with my shopping or my games. Always charged enough to do what I need doing at any time of the day or night. Who wouldn’t want someone who can double up not only as a partner and a friend, as a shopping aid as well as a research manager? Wouldn’t it be fun to be able to connect to one person in more ways than one? Twice as nice right? Oh, I could keep adding finer points but on the whole, if these five boxes are ticked, I’ll be more than delighted. However, when I discussed these with my friends, all they did was laugh out loud and kept taunting me that I shall never ever find my true Valentine. And that was the only push I needed, and off I went looking for the love of my life….. and voila I found the one who was meant for me, My Valentine, My #UnconditionalLove. 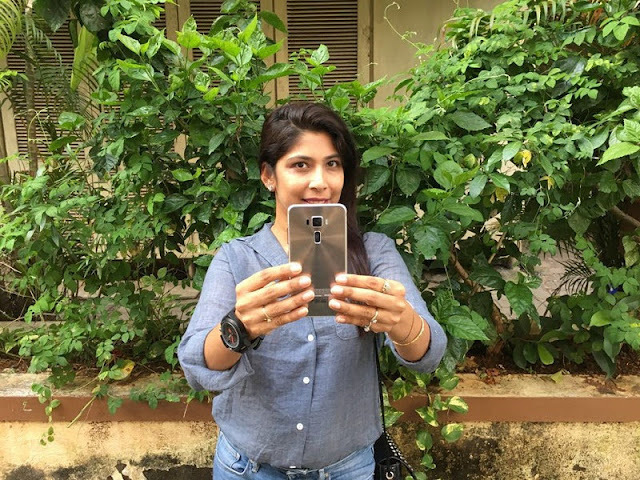 My Asus Zenfone - Want to know why? My Zenfone is covered with a colourful case to reflect your personality and a gorgeous touch with a ceramic finish and bumper that offers great protection and easy fit. My Zenfone is backed with a gorilla glass to ensure strength and resist damage and scratches automatically. And on the inside an amazing high-speed Intel ATOM processor that helps the gadget work splendidly while using multiple phone features. My Zenfone is infused with a sensitive responsive touch that takes a few seconds to respond. Additionally, it offers a one-touch Interface that allows accessing multiple apps at the same time. My Zenfone is in for a long haul with a supercharged battery, with a long long battery life even while using multiple applications for an extended time. My Zenfone is dual SIM operated as well, so keep your family and friends and your work and colleagues apart. So you see I found my perfect partner, I need no man in my life, cause I have the Zenfone, My Valentine, My #UnconditionalLove.